Photos of Volubilis Roman Archaeological Site. Morocco. Photos of Volubilis Roman archaeological site, Morocco. From the 3rd century BC Volubilis was a Phoenician then Carthaginian settlement at the foot of the Jebel Zerhoun mountain overlooking the fertile Gharb Plain in north eastern Morocco. After the fall of Carthage in 146 BC to the Romans, Volubilis came under Roman rule as part of its client state of Mauritania finally being annexed in 44AD by Emperor Claudius. The fertile plains of Volubilis produced grain, highly valued in the Roman Empire to feed Rome, olive oil from the olive groves on the mountain slopes as well as wild animals for the gladiatorial spectacles of the Roman Empire. At its height Volubilis had an estimate population of 20,000 which was substantial for a provincial Roman city and became the administrative centre of Mauretania Tingitana. After the collapse of the western Roman Empire in the 6th century AD Volubilis continued to be inhabited by Christian and Jews who were the descendants of ancestors who had been persecuted in the late Roman Empire. In 708 the Arabs conquered North Africa and in 788 Moulay Idriss, a direct descendant of the Prophet Mohammad, established the Idrisid dynasty in Volubilis, renamed Ksar Faraoun. Today Moulay Idriss is buried at the nearby hill ton of who is buried at nearby Moulay Idris. In the 17th century Moulay Ismail made nearby Meknes the Imperial capital and stone from Volubilis was used to build the new city. In the 1830s when Morocco was under French Colonial rule scientific explorations found the Roman remains and by the late 19th century the first archaeological excavations started at Volubilis. 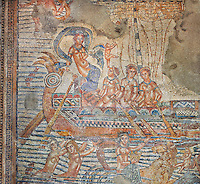 The recovery of Roman ruins was used a political tool by the French to strengthen European links with North Africa so legitimising their colonisation programme. At the centre of the archaeological site is the Basilica, the building used by Romans for legal hearings which were later converted into the first Christian churches. Most of one wall of the Basilica remains standing along with its interior its columns. Next to the Basilica is the Capitoline Temple dedicated to the three chief divinities of the Roman state, Jupiter, Juno and Minerva. Civic assemblies were held in front of the temple to beseech the aid of the gods or to thank them for successes in major civic undertakings such as fighting wars. It was partly restored in 1955 and given a more substantial restoration in 1962, reconstructing 10 of the 13 steps, the walls of the cella and the columns. There were four more small shrines within the temple precinct, one of which was dedicated to Venus. 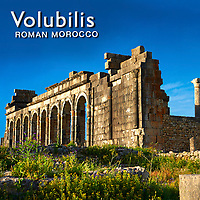 Photos of Volubilis can be downloaded and photo art pictures of Volubilis can be bought on line.